Hazratbal Shrine is located in Srinagar. According to popular Muslim legend, the mosque was built to keep the hair of the prophet Mohammed. Hazratbal shrine rises on the coast of Lake Dal. The hair of the Prophet Mohammed is kept in a special dish of milky glass. The name of this attraction means majestic place. Hazratbal shrine is the most famous and important Muslim religious building in the area. The beautiful marble building is reflected in the transparent waters of Lake Dal. Hazratbal’s relic of the sanctuary - the hair of the Prophet Mohammed appears in public only during religious holidays. Crowds of people flock to Hazratbal sanctuary for Friday prayers. This is the only domed mosque in Srinagar, other mosques have pagoda roofs. The mosque unveils a beautiful view of green meadows and majestic silence sunk into mountainsides, broken only by the ringing of the cows’ bells. The history of the temple began in the early seventeenth century, when Emperor Sadiq Khan ordered to make a beautiful garden in this place. In the garden was built a magnificent palace - Ishrat Mahal, which translated meant house of pleasure. He used it to host lavish events that were directly associated with his name. The building was completed in 1623. In 1634 the Emperor visited the palace and ordered it to be transformed into a place for prayers, which required some adjustments and additional work. In 1699, when the hair of the Prophet Mohammed arrived in Kashmir, it was originally stored in the sanctuary Naqashbad Sahib, which is located in the heart of the city. Once it became clear that the site is not suitable for the invading hordes of people who want to see the sacred relic for themselves, it was decided for it to be moved to Hazratbal, which at that time was called Sadiqabad. The construction of a modern marble edifice begun in 1968. Tourists can easily reach the sanctuary Hazratbal, since it is located twenty-five kilometers from the nearest airport. This airport is connected with many major cities in India. When celebrating a big Muslim holiday, the sacred relic - the hair of the Prophet Mohammed, is available for viewing by anyone who is interested in it. During some weekends the relic is also shown. Crowds of pilgrims who want to be as close as possible to the hair of the Prophet, are a truly impressive sight. 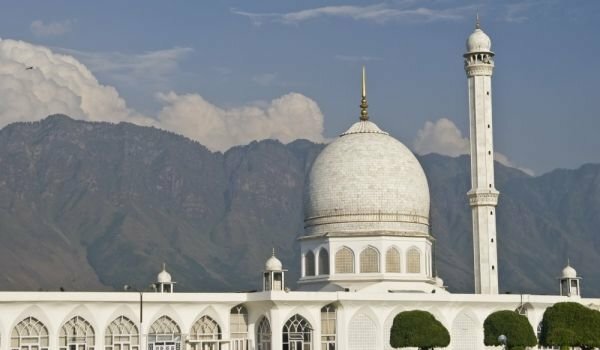 The journey to Hazratbal enables tourists from around the world, who want to experience the majesty of this religion, to engage in the interesting and full of attractions fairs, organized every year in Hazratbal. The most interesting and most important of them is called Shab-e-Meraj. Hazratbal can be reached by train, bus and taxi. To cross the mountains on the highway, it takes about ten hours. However, this opens the eyes of tourists to breathtaking views of the mastery of nature, which seems to be one of the masterpieces created exactly of Hazratbal.